One of my favorite places to grab lunch with friends or a delicious French pastry to go is La Madeleine...the food is homey and delicious, but the prices are reasonable. I was surprised and very excited when I received an e-mail last week inviting me to attend a VIP blogger event at a local La Madeleine that had recently undergone an extensive remodel. The event was last night, and I had a fantastic time!! I had a chance to see my friend Stephanie from The Chickpea Chickadee...and I met another local food blogger named Lauren from Oh My Puddin. Go check out their blogs if you haven’t...they’re great reads with lots of fun recipes. I met Stephanie outside the restaurant, and we walked in together. As soon as we entered the restaurant, we were welcomed warmly by a friendly staff member and escorted to a lovely private dining room in the back. We were served wine and had a chance to mingle with some of the other bloggers in attendance. It was really fun to meet some fellow San Antonio bloggers and get to know them and hear a bit about their blogs! I also met Patrick Esquerre, the founder of La Madeleine. 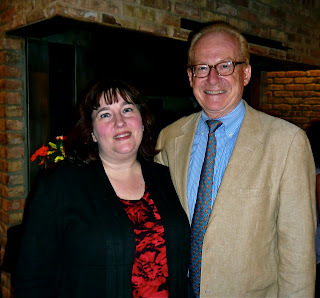 Me with La Madeleine's founder, Patrick Esquerre. Mr. Esquerre is originally from the Loire Valley in France, and he opened the first La Madeleine in Dallas in 1982. As we chatted, he told me one important lesson that he had learned: when you don’t know to do something? Just listen. He opened the first La Madeleine as a restaurant geared toward women. He listened to what his customers liked most about the food, decor, and overall experience. He must have listened very well, because his company quickly grew and has become very successful. Over the past 30 years, he has expanded to 60 locations. Most of his restaurants are in Texas and neighboring states like Oklahoma and Lousiana...but there are also locations in Virginia and Washington, DC. We had a chance to visit with La Madeleine President and COO Philip Costner as well. He told us about the company’s commitment to providing quality food that is served by friendly employees in a pleasant, welcoming environment. Both he and Mr. Esquerre were so friendly and down-to-earth themselves...which makes me even happier to be a La Madeleine customer. Much like my experience with the Reichert family when I visited Red Gold Tomatoes in Indianapolis earlier this year, it makes me feel a strong personal bond with a company when the very top-level executives treat me so kindly! We were treated to a buffet featuring some of La Madeleine’s delicious signature items: Casesar salad and tomato-basil soup, Chicken La Madeleine, seasoned green beans, rice pilaf, and quiche. While we ate, we had a chance to learn more about the history of this Texas-based company from both Mr. Esquerre and Mr. Costner. Two of my favorite items at La Madeleine: their famous tomato-basil soup and Caesar salad! Chicken la Madeleine with a creamy mushroom sauce, seasoned green beans, rice pilaf, and two kinds of quiche. After dinner, it was time for a personal tour of the remodeled location to learn about the modifications that were made...and the reasons behind them. This location now features large high-def screens behind the counter at the ordering area. The menu items are easy to read, which helps speed your time in line...and the cook area is open so you can actually see your food being prepared. The addition of large monitors with the menu make ordering faster and easier! The pastry case...could you pick just one? My favorite are the little mini fruit and cream tarts! The restaurant has been designed to have the look and feel of dining in a cozy French country home...and it now feels more open, with high ceilings and wood floors. One of the things that Mr. Costner mentioned that I was happy to hear is that the restaurant has done away with trays. Rather than carry your food to the table when it's cooked, you simply take a seat after ordering...and your food is served to you. Before we knew it, it was time for dessert...my favorite part of any meal! We were treated to an assortment of mini pastries and mini parfaits, along with their classic Strawberries Romanoff. I correctly guessed the three ingredients in the delicious Romanoff sauce, so I was given a $10 gift card to use the next time I eat at La Madeleine! A tray of delicious mini tarts and mini parfaits. I love the mini fruit tarts, but tried something new this time: the strawberry cheese mini parfait! It was the perfect little after-dinner sweet bite! One of La Madeleine's signature desserts: Strawberries Romanoff...fresh strawberries topped with a delicious, creamy sauce. The sauce is the perfect consistency...not too thick, not too thin! Heavy thunderstorms were in the forecast, so it was time to say adieu after dessert and head home. There was still one last surprise waiting for us: La Madeleine logo tote bags filled with gifts for us to take home! Each blogger was given a package of fresh-baked oatmeal-raisin mini cookies, a baguette, a jar of their new low-fat tomato-basil soup, and a $10 gift card for a future visit. Our hosts were so generous...I can’t thank them enough for inviting me to their lovely location last night. I love eating delicious food like what's served at La Madeleine...but knowing how genuinely nice the people who run the company are? That makes it even better! We'll have to go next time we're down!